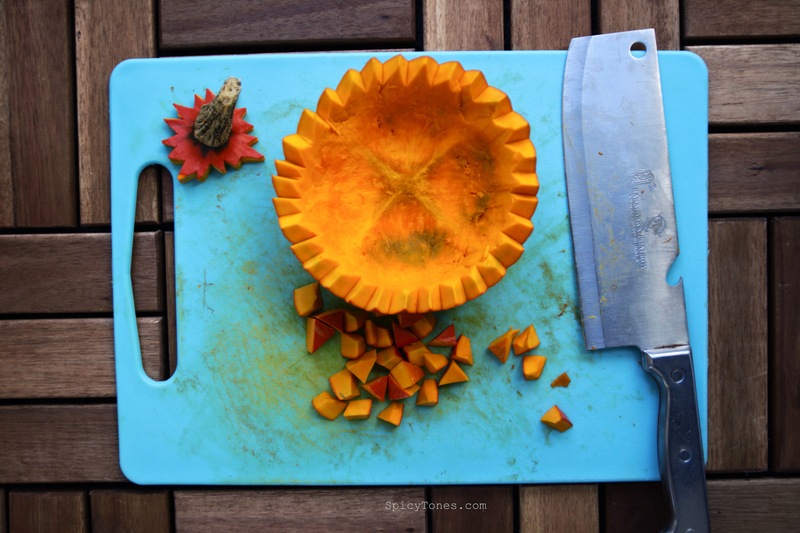 Halloween is coming, pumpkins are everywhere to be seen. Is it the same in all countries? I love seeing pumpkins, not only that I wish to know how to carve them and put candles inside them, they also remind me very much of Cinderella. You know, when the fairy flicked her magic wand and turned a pumpkin into a beautiful, glamorous carriage, and then Cinderella went to the castle with that and met her Prince Charming. And as you know eventually they live happily ever after. I know It sounds childish which I admit, but this story always make me feel like: Awww… I want that too. I know that it is never going to happen to me unless you are Kate Middleton, well literally. And in real life, it’s simply impossible to have a little tiny fairy to turn a pumpkin into a carriage. Very disappointing. I would really like to blame Disney for lying to all the innocent children out there, for letting them to believe in stories and things that do not exist. Sadly but truly this world is not as wonderful as we were told, and animals are not friends, most of us eat them. I’m thinking that it might be a bad attempt to over protectively keep children inside the ‘wonderful world’ bubble and away from the reality. They will then face too many bad surprises when they grow up. Back to the pumpkins. They are not just for decoration and their seeds. See? You can make a super delicious meal like this one, which my mom taught me. 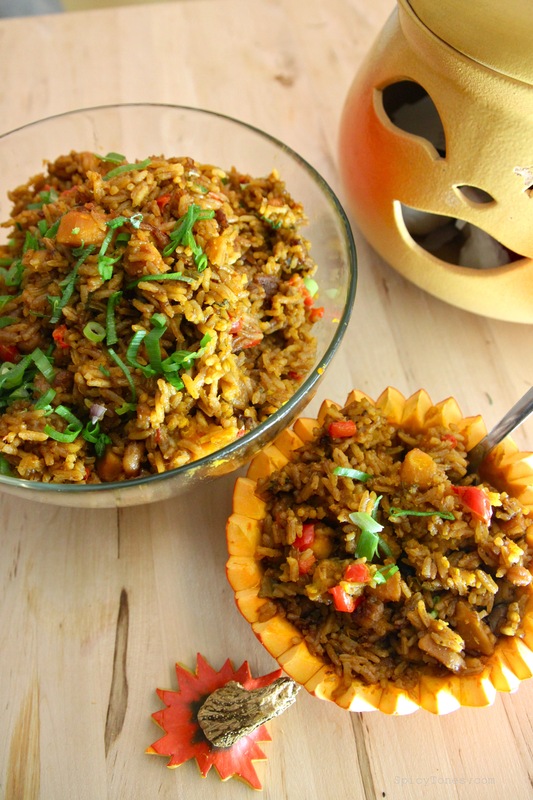 Translated directly from Chinese, it is called Golden Pumpkin Rice. My mom used to make this dish back then. 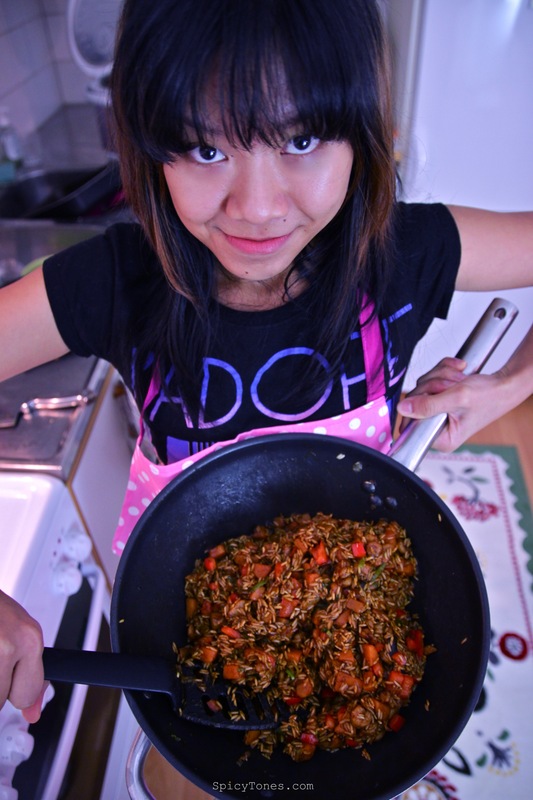 I remember many times a row she did not succeed and accidentally turned the pumpkin rice into a pumpkin porridge. But, it tasted still really good. 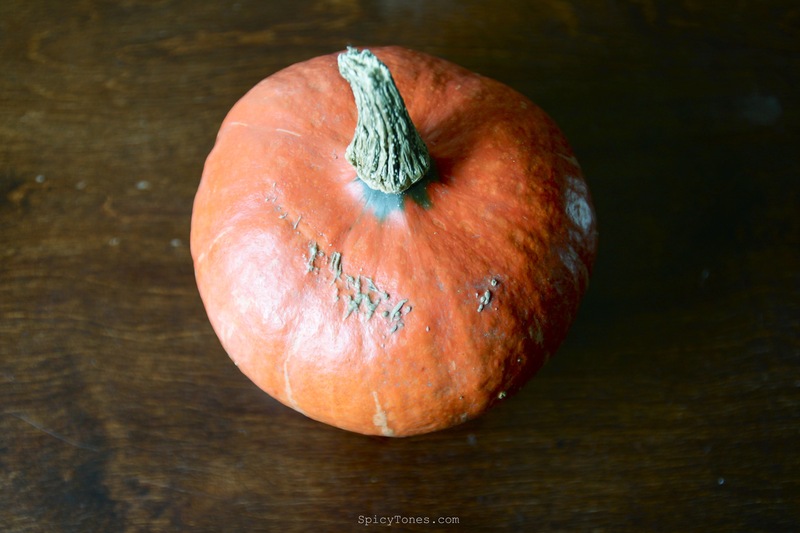 Pumpkin itself is sweet and has a unique fragrance, together with the flavor of sauté shallot and the sweetness from juicy paprika. Man! I’m in heaven! Guess what, this time I managed to make it perfect! My god, it tasted so good, the texture is there, the flavor is there and the nutrients are there. I kept telling my sister and my mom so proudly and kept explaining how great it was when the flavor lingered in my mouth. You have no idea. You simply cannot describe. 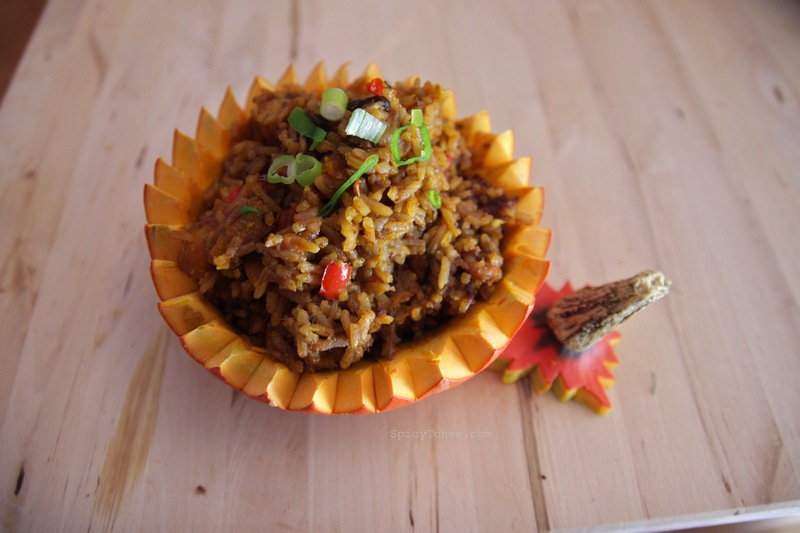 It was so good that I must squeeze out time from my busy life and share this recipe with you!! 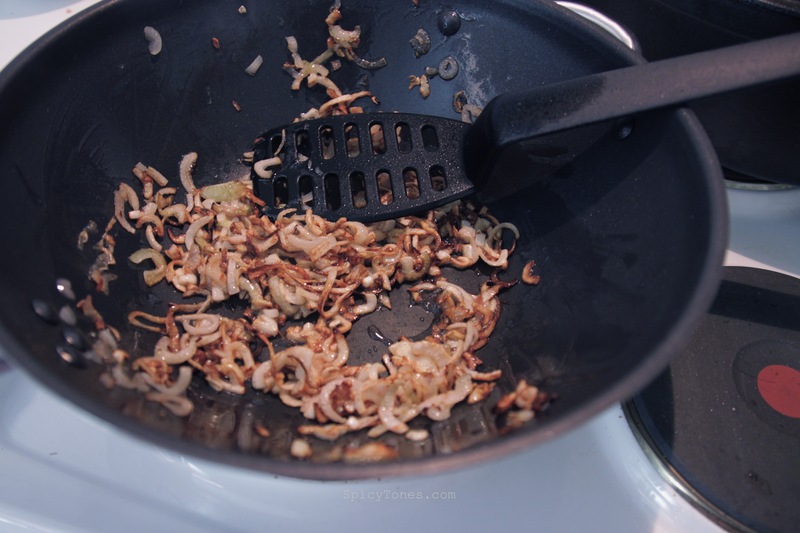 1) Heat up 2 tbsp of oil in wok and fry shallots until brown and fragrant. 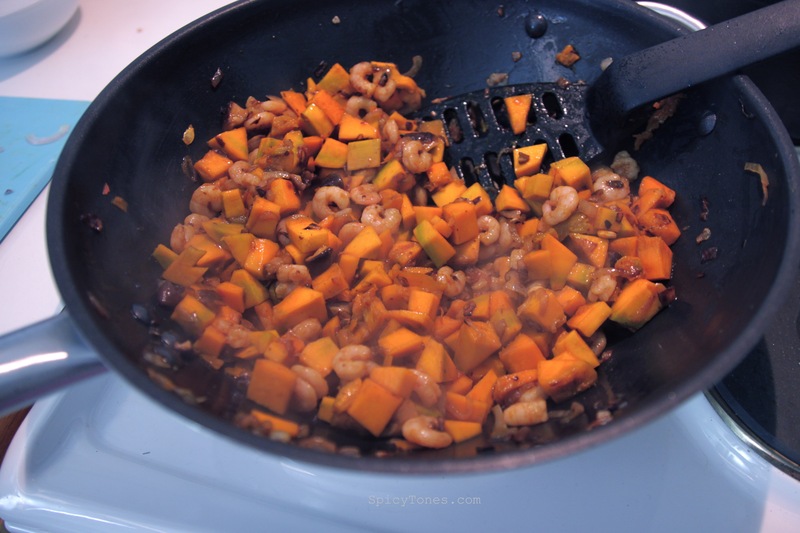 Add in diced pumpkins, shrimps, shiitake and stir fry until the pumpkins are cooked/ soften. 2) Add in rice, paprika, soy sauce, dark soy sauce, salt and pepper. Mix well. 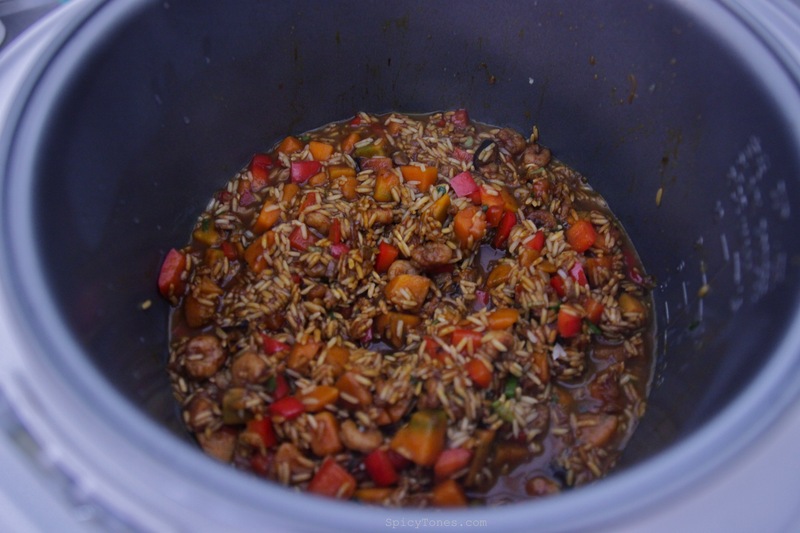 3) IF YOU HAVE A RICE COOKER: Add in 1 cup/160ml of broth or vegetable stock and stir-fry for a couple of minutes. Turn off heat and put everything into the rice cooker. Add the remaining 3 cups/ 480ml of stock and cook it through. 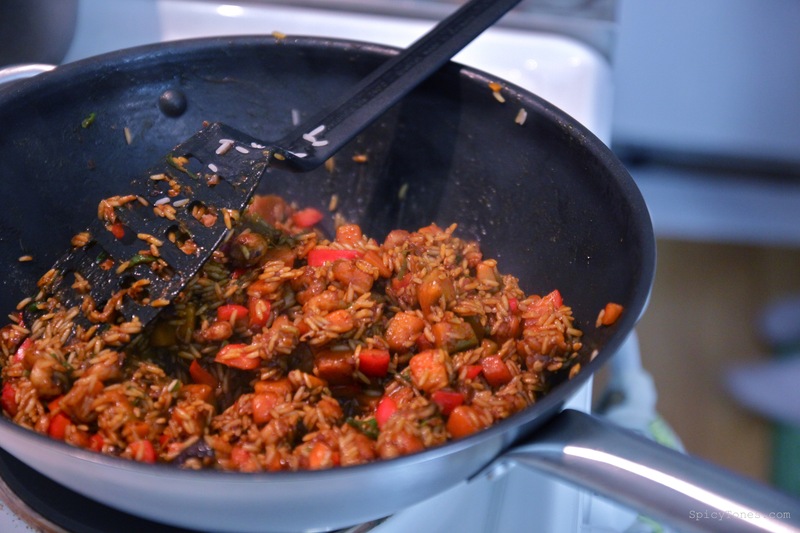 Stir once when the rice is done and keep warm for 5 minutes. IF YOU DON’T HAVE A RICE COOKER: Add in all the broth or vegetable stock and bring to boil. Keep stirring to prevent sticking from the bottom. Reduce heat to medium low. Cook for 5 minutes. Turn off heat, cover with lid and let it steam for 20 minutes. 4) Serve with chopped spring onion/ fried onion. Wish me luck for my thesis. 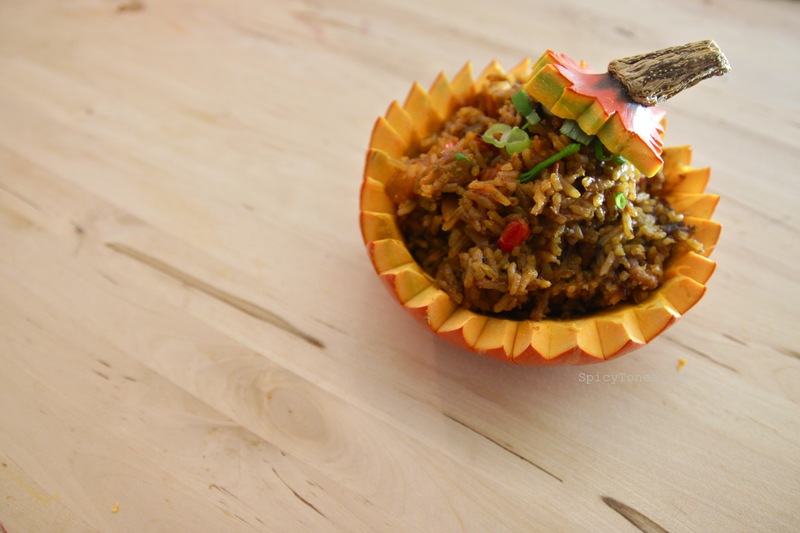 Never added pumpkin to my rice… great idea! 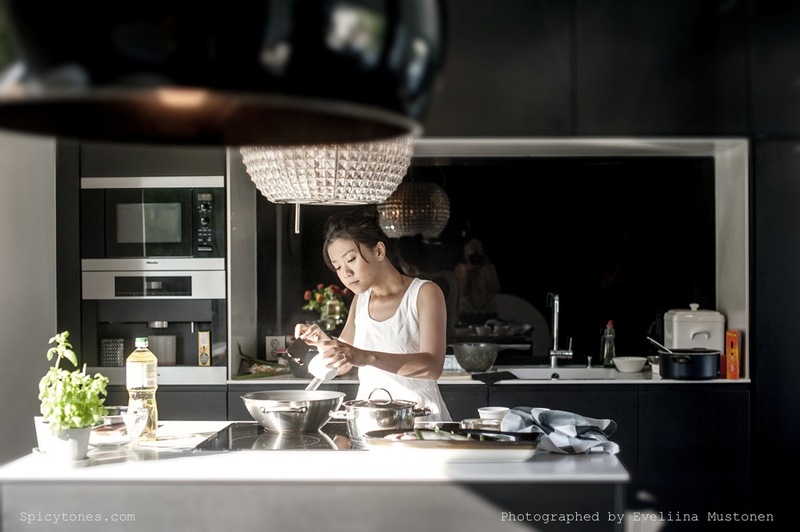 Thanks for the recipe… and your pictures rock. Looks amazing as usual !! It looks delicious. Funny presentation. 🙂 Well, I want to wish you a lot lof luck, with everything, but especially with your thesis. I suspect that you will do well on your thesis but good luck anyhow. Nice to have known you. Thanks for sharing this post.it such a nice Rice cooker having stainless steel base .i am happy to buy this.